It has been a while since I’ve posted here so I thought it opportune to post a short summary of our most recent game. This time with a lack of photos the report is somewhat brief. The encounter was a fictional American Civil War engagement developed using the Road to Glory. 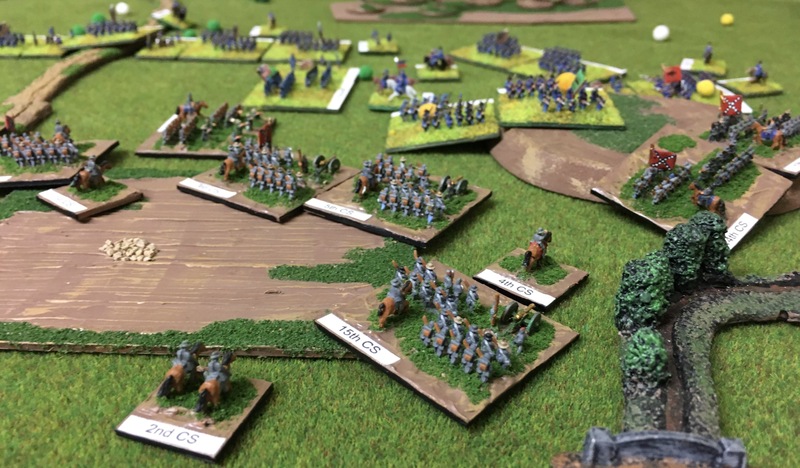 Each army comprised 3000 points but the card system ensured a very challenging game as troops arrived over the course of the game. In game turns the Union commander opted for a low card, Advance Guard Left #2 but with only a small portion of his army it would be several hours until the Union forces were deployed. The Confederate commander selected Returning Detachment #18. Only two divisions were not on table and even these would arrive before any Union reinforcements. Lee’s army, having given the main Union army the slip, had crossed the Rappahannock in two groups. Under his immediate command were two Corps. II Corps, under Ewell, was concentrated and elements of A.P Hill’s Corps would be on the field soon. Lee, aware of the situation seized the initiative and ordered a general advance. The Union forces on the field were well to his right. Therefore all his divisions would echelon to the right and attack. They would have insufficient time to form up in direct support but rather advance to the right in succession. Rhodes’ Division, Lee’s largest at five brigades, would advance from the centre and attacked at an angle the Union left. Adam’s Brigade showed much valour as it swept forward and into the Union line in an area known as the angle, where the Union line sharply turned 90 degrees. The initial attack was supported by two artillery battalions, and later Dole’s Brigade. To Adam’s right Daniel’s and Iverson’s Brigades advanced in support. They formed a dramatic picture as they advanced through cornfields into rifled musket range of the blue clad enemy. Having exchanged musket fire soon these two brigades would surge forward. As some Union brigades crumbled others realigned in a desperate attempt to halt the Rebel attacks. In the coming hours additional Union divisions deployed and were thrown into line, extending the Union line and forming the Union centre. As they deployed elements of Johnson’s Confederate Division and artillery aligned opposite some 800 yards distant. 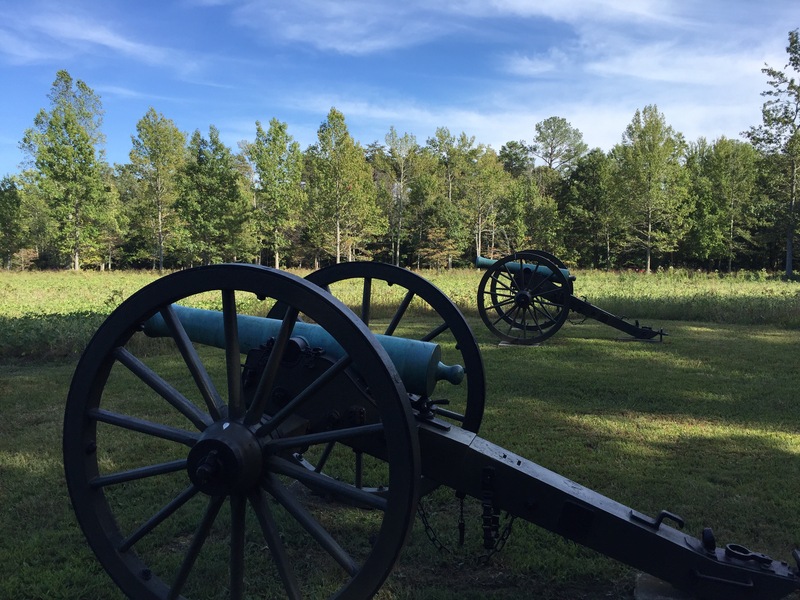 The Rebel artillery here, drawn from several divisions eventually comprised some 50 cannon and outnumbered the Union guns. Above, the Rebel centre as the gun line begins to form. A portion of a large wooded area is visible on the left. A large wooded area covered the Union right. Additional Union reinforcements, drawn from three Union Divisions, deployed in the open as elements of two Confederate divisions pressed through the woods. Early’s Division advanced on the left while three brigades from Johnson’s division provided support on their right. A vigorous exchange took place, with the Rebels forming in parts along the wood edge while in other areas attacking through the woods Union Brigades that had advanced into the woods. In time the initial Rebel advantage here was lost and as the battle continued several butternut brigades were forced back deeper into the woods. Meanwhile, on the Confederate right, Rebel forces continued to focus their attacks on the Union left. Heth’s Division, having marched rapidly by road to the far Rebel right deployed to attack. Below, on the right, the brigades of Pettigrew and Archer prepare to attack the disorganised Union left. Daniel’s Brigade has just completed a successful attack on the angle. The resulting retreat by the Union brigade holding the angle has disordered several other Union brigades. The large field in the foreground contained a large cornfield and slowed the initial Rebel advance. For a time Heth’s Division looked set to sweep the exposed Union left from the field. However, Union forces, yet again, extended the line before the Union line could be broken. Indeed, Union forces now overlapped Heth’s Division and in turn advanced tentatively against the Rebels. As casualties mounted Pettigrew’s and Archer’s Brigades were driven back.